The famous burger holds a La Verne heritage tied to the founding family. In-N-Out. The name alone has the power to make a Californian’s mouth salivate. 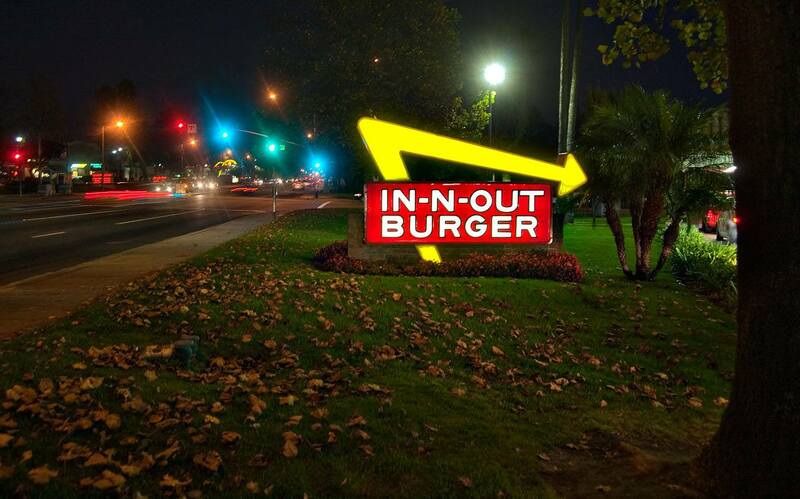 Many know it as the home to the juicy double double, but few know that this family-owned fast-food chain has roots in La Verne. Although the Snyder family started their burger business in Baldwin Park 62 years ago, it was the family’s time spent in La Verne that made the In-N-Out culture what it is today. The idea of a drive-thru hamburger stand, where customers could order through a two-way speaker box, was unique. But in 1948, Harry Snyder’s idea caught on, and California’s first drive-thru hamburger stand was born. Little did they know then the impact it would have on the future of fast food. Guy and younger brother Rich were both students at Bonita High School in the late 60’s. Guy (’69) was known for his antics outside of school. Whether he was racing his car through orange groves in La Verne or playing pranks at Bonita, Guy was always known for his liveliness and humor. Later, Guy would lead In-N-Out to form a racing team. Guy first drove the car, “Flying Dutchman,” which led to an In-N-Out NHRA professional racing team. Rich (’70), on the other hand, was known more for his involvement in school and for being studious. Though different in many ways, both boys left a lasting impression to Bonita’s atmosphere. “It seemed like everyone knew those boys,” Kathy shares. The boys always had friends around them. Guy would pile friends into his car and hang out at In-N-Out after school or even bring the In-N-Out Truck to the parking lot of Bonita High School to feed students after a school dance. As the years passed, the bond between the boys and the La Verne community would never be broken. Some of the early expansion of their business was in the Pomona Valley. The family would see some hard future times in the midst of success. During a routine work day in December 1993, Rich Snyder, then president of In-N-Out, was concluding a one-day trip to five locales when his chartered Westwind 1124A jet plunged to the ground and exploded in flames near John Wayne Airport in Irvine. All five passengers on board were killed, including Rich, 41. Federal investigators theorized that the pilots lost control when the plane flew into a “wake turbulence” created from downdrafts from a Boeing 757 landing just ahead of it. After Rich Snyder’s death, brother Guy, known as “Dutch” to his friends, became chairman of the board and CEO in 1993. Guy led the company with his mother Esther for the next six years, opening more than 40 new locations, until his death six years later, in 1999, of an accidental drug overdose. Despite the tragic losses, In-N-Out continued to grow with Esther Snyder as president until her death in 2006 at age 86. (Harry died in 1976.) The presidency was passed on, with some controversy, to Mark Taylor, former vice president of operations. And while Taylor is the first non-family member to become president, he holds it in trusteeship. The company’s sole heir is 27-year-old Lynsi Martinez, daughter of Guy from his 17-year first marriage to Lynda, and the only grandchild of Harry and Esther Snyder. Martinez, who lives in Glendora, will take ownership of her father’s share of In-N-Out on her 30th birthday. When Lynsi gains her company status, she will be thoroughly versed in In-N-Out’s philosophy and reputation: the belief that fast food should be made from scratch, and the wants and needs of the customer should be met. Harry also believed that in addition to a good product, if you treated your employees well and your customers even better, the business would be successful. Because of the Snyder’s never-changing philosophies, In-N-Out has become a West Coast love affair. 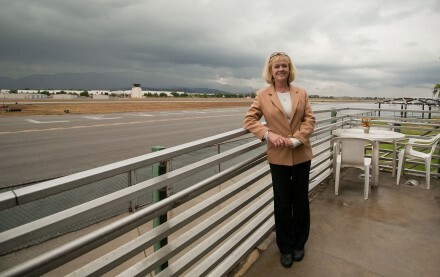 “Hamburgers, hotrods, and drive-ins; you can’t go wrong in Southern California,” Kathy says from her own restaurant near the National Hotrod Association drag strip. In-N-Out is cherished even by those who have taken a no fast food vow. “I usually don’t like to eat fast food, but I’m always up for In-N Out. It’s just that good. Their quality just can’t be matched. It’s a one of a kind taste that I can always count on. I love it,” says Sal Diaz, University of La Verne alumnus. In some ways, In-N-Out never had to grow up; quite the contrary, this large, family-owned business, well-known in Southern California pop culture, proves consistency and quality are key components to a successful business. Today, In-N-Out receives an enthusiastic endorsement from celebrity culture. Before the 2007 Academy Awards, singer Beyoncé confessed to making a stop at In-N-Out. Chef Julia Child, famous for her TV cooking show, sent her assistant to In-N-Out to satisfy her burger craving while she was hospitalized. Rocker Courtney Love insisted on visiting an In-N-Out in 2004 just before entering rehab. In-N-Out holds a time travel culture: Its simple goodness, schooled in the city of La Verne, remains constant. The colors, the menu, the cheerful employees dressed in white, and the same throw back drive thru greeting: “Welcome to In-N-Out, may I take your order?”will always echo the rich La Verne history of the Snyder’s burger. Animal style anyone? A “Secret Menu” reflects the raw individualism that makes In-N-Out unique. Customers can customize burgers, even fries. A burger ordered Animal Style comes doused with fried mustard and pickles, extra special sauce and grilled onions. Animal Style fries are similarly enhanced. The vegetarian option holds no meat or cheese. The low-carbohydrate Protein Burger comes wrapped in a large leaf of fresh lettuce. Last, but certainly not least, the hardy 4-by-4 is for the truly hungry, with four meat patties and four slices of cheese. My kids just visited from Florida. They hit In-N-Out right after landing at Ontario Airport. They went again the next day. And again after going to the Angels Dodgers game yesterday! They miss In-N-Out in FL. For Christmas I send them t-shirts, stickers, or our empty wrappers! We all love INO. Mmmm, getting hungry!